Among many other things, mountain nerd is thankful for the beautiful, clear fall weather we’re enjoying in Whistler today, as well as the cold rainy forecast for the next week that should coat the mountains with a bunch of early snow. I’m also thankful for some new websites I recently came across that provide lots of mountain-related resources and fascinating reads. First is a history of exploration blog with the great title “Time to Eat the Dogs” (read the “About” section if you don’t get the reference). There’s lots of mountaineering history (check out “The Myth of Pure Experience” “Routes Up the Mountain” and “Mountains of the Moon“) mixed in with fascinating articles on polar, maritime, tropical, and even space exploration. Exploration has always been a central theme in writing about coastal mountaineering. 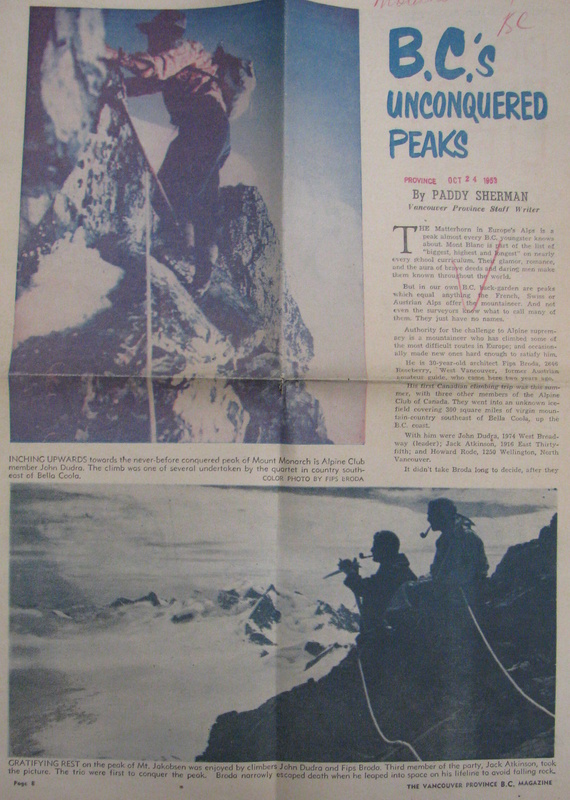 Paddy Sherman, "BC's Unconquered Peaks," Vancouver Province 24 October 1953. The site also has tons of great links. Check out, for example, this online gallery about the history of African cartography, and private mountaineering historian Bill Buxton‘s impressive bibliographies and commentary, focusing on Himalayan mountaineering.”Time to Eat the Dogs” has been added to the Blogroll, and there are several new resources on the “Links” page. The Mountain Library – A catalogue of reviews, lists, and other commentary on books about mountaineering, mountain ecology, culture, photography, etc. The MountainWorld Blog – A blog dedicated to mountaineering’s past present and future by Jake Norton, a professional climber, writer, and photographer. This site just got nerdier.